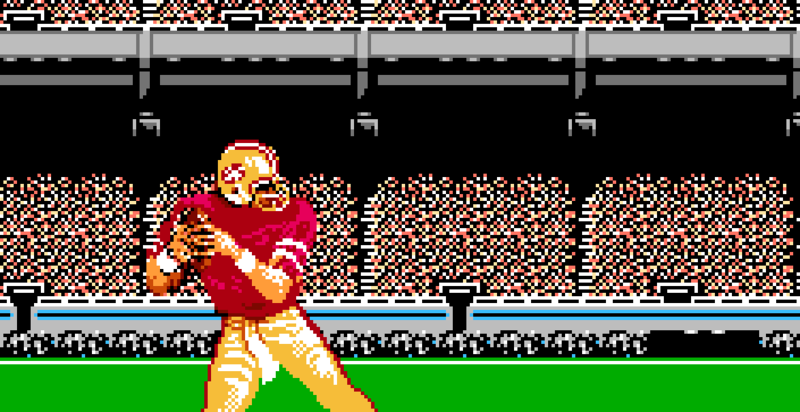 The NFL kicks off their annual postseason playoffs today, but we all know that football is so much better in 8-bits. That’s why we’re simulating this year’s games in what Tim and I determined to be the greatest title ever produced for the NES. For this simulation, we will be using the modified version of the game developed by TecmoBowl.org that features updated rosters and modern offensive and defensive schemes. Cam Newton and the Panthers jump out to a quick lead; making their way down field and capping off the drive with a 31-yard touchdown pass to Jericho Cotchery. 7-0 Panthers. The Arizona Cardinals appeared to be on their way to a quick tying score after a huge 50-yard kickoff return by Ted Ginn and a Kerwynn Williams dash to Pittsburgh 10-yard line, but quarterback Ryan Lindley threw an interception in the end zone as the first quarter comes to a close. Luckily for the Cards, the Panthers’ next drive stalls, forcing a punt. This time, they capitalize on a 40-yard touchdown bomb from Lindley to Larry Fitzgerald. Tied 7-7. Arizona gets the ball right back after a Cam Newton interception. They run the ball for a first down, but eventually settle for a 52-yard field goal. 10-7 Cardinals. The Panthers’ two-minute offense goes to work and successfully makes their way into Cardinal territory before kicking a 41-yard field goal to end the half. Arizona takes the kickoff to open the second half, but fails to garner any offensive momentum and punts after three unsuccessful plays. The Cards’ defensive unit responds by getting two consecutive quarterback sacks from Kevin Minter and Larry Foote. They stop the passing game on third down to force a punt. The Cardinals passing game clicks again and Ryan Lindley hits Michael Floyd for 37 yards and a touchdown. 17-10 Cardinals. On to the fourth quarter, where Cam Newton looks to take over the game with his feet, but he is sacked again by Larry Foote and coughs up the football. The Cardinals recover the fumble at the Carolina 33-yard line but the Panthers catch a lucky break as the eventual 47-yard field goal attempt clanks off of the uprights and is no good. Newton’s scrambling pays off on the ensuing drive as he breaks away for 60 yards to the Arizona 18. The Cards defense holds after that, bringing up 4th & 5. A short pass gets them the first down on the 3-yard line and DeAngelo Williams punches it in for the score with 1:06 left on the clock. Tied 17-17. Kerwynn Williams breaks a huge run to the Carolina 30-yard line, but time expires before the winning field goal can be attempted. We’re headed to overtime! The Cardinals win the toss and Ted Ginn beats the kickoff coverage for a clutch return all the way to the Panthers’ 22. Lindley hits Kerwynn Williams in the flat on the very next play and he breaks three tackles on his way to a game-winning score for the Cardinals! Cardinals win 23-17. The Arizona Cardinals advance to the next round! One of the NFL’s most bitter rivalries takes center stage again in the opening round of the playoffs. The Ravens take the opening kick and return it all the way to the Pittsburgh 40-yard line. Joe Flacco tosses it deep for a connection at the 5, and Bernard Pierce punches it in on the next play for the touchdown. 7-0 Ravens. The kickoff afterward is downed for a touchback. Ben Roethlisberger comes up big on the first play of the drive by throwing a ball just past a diving defender and connecting for 81-yards on a touchdown pass to Antonio Brown! Tied 7-7. Baltimore’s next drive goes nowhere, and they punt after three downs. Pittsburgh fares no better as Heath Miller drops a wide open pass on third down, and Pittsburgh will also punt. End of the first quarter. The Pittsburgh punt is returned across midfield, all the way down to the 20-yard line. Joe Flacco misses a wide open receiver in the end zone on 3rd and goal, but the 32-yard field goal by Justin Tucker is good. 10-7 Ravens. On the next drive, the Steelers’ deep passing attack strikes again as Roethlisberger hits Antonio Brown for a 79-yard touchdown pass to regain the lead. 14-10 Steelers. Following the kick, the Ravens drive the field in quick order, and Joe Flacco scrambles for 17 yards to set up a 55-yard field goal attempt to end the half. The Justin Tucker field goal has the distance, but misses wide left as time expires. The Baltimore defense comes out very aggressive in the second half, and after a bad return on the kickoff, they force a safety by tackling Le’Veon Bell in the Pittsburgh end zone for a safety. 14-12 Steelers. After the free kick, the Ravens rush the ball to around midfield. Joe Flacco finally dials in and hits Steve Smith for 49-yard touchdown pass. 19-14 Ravens. Pittsburgh attempts a little trickery on the next drive with the flea flicker, but it falls incomplete. Not to be denied, however, Antonio Brown makes an incredible diving catch on a long pass, setting the Steelers up at the Baltimore 21. It’s all Le’Veon Bell from there as he beats the entire Baltimore defense on a dash to end zone. 21-19 Steelers. Baltimore fights back with a methodical drive down the field, capped by a 2-yard run by fullback Kyle Juszczyk to take back the lead. 26-19 Ravens. It’s now the final quarter and the Ravens lead is short lived. Ben Roethlisberger once again leads the team down the field and takes it in himself for a 12-yard touchdown run. 28-26 Steelers. The Ravens have three minutes left to win the game, but Joe Flacco throws a pick at the Pittsburgh 44. The Steelers once again break out the flea flicker, this time with much more success. The trick play gets them to the Baltimore 10 and Heath Miller catches a pass in the end zone on the following play to seal the win. Steelers win 35-26. The Pittsburgh Steelers advance to the next round! That’s as far as we got in our tournament, but we hope you enjoyed it as much as we did!